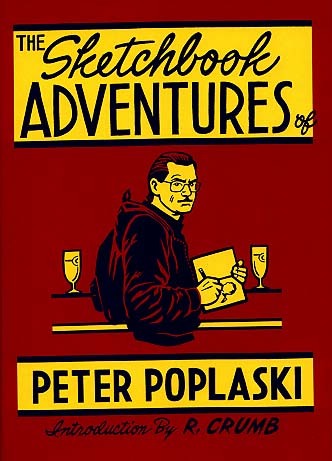 THE SKETCHBOOK ADVENTURES of PETER POPLASKI (2005), with an Introduction by R. Crumb. Poplaski is an "artist's artist," widely admired by the comics industry cognoscenti. He drew ten definitive BATMAN and SUPERMAN covers for the historic Sundays and Dailies series co-published by DC Comics & Kitchen Sink Press in the '80s and '90s. 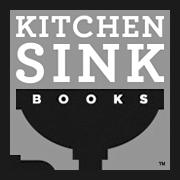 He was Kitchen Sink's Art Director for many years, working closely with and designing books for Harvey Kurtzman, Will Eisner, Milton Caniff, R. Crumb and other cartooning giants. 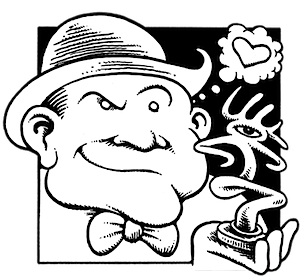 Poplaski authored and designed the recent Best-Seller (100,000+ copies 1st month), THE R. CRUMB HANDBOOK (MQP Publishing). Poplaski's eccentric penchant for dressing in costume as ZORRO was pictured in both the New York Times and New Yorker and captured earlier in the pages of Crumb's Hup! and within this sketchbook. The bottom line is that Poplaski is an extraordinary artist in his own right. 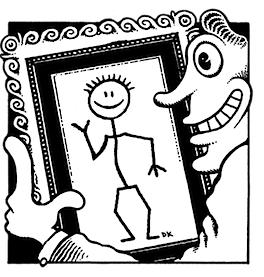 The Sketchbook Adventures of Peter Poplaski contains several hundred finely detailed observations of people and places, many in the small town in France where he lives, near Robert and Aline Crumb, two of his biggest fans. Others professionals contributing back cover blurbs: Will Eisner, Frank Miller, Mark Schultz and Harlan Ellison. Hardcover with dust jacket. 208 pages. The case-bound cover is silk-screened in three colors. Fully illustrated throughout. From Denis Kitchen Publishing. ISBN # 0-9710080-4-3. To be a serious artist is a heroic act of will. In the contemporary world, the marks made by such an artist, whether by pencil, brush or chisel, should be bold, direct, and above all, mean something, like the "mark" of Zorro, the adventure character created by Johnston McCulley in 1919. Zorro is the heroic personification of what an artist should be: a man of culture by day who transforms into a man of action by night, riding to balance the scales of justice. For an artist, to render some sort of truth about life and the experience of the world is the highest form of justice. This sketchbook is a collection of little duels with nature: parry, riposte, lunge, retreat, culled from many sketchbooks maintained during tours of America and Europe over an 8 year period. They are practice sessions leading up to the more difficult assault of painting. It is a battle that begins at dawn, for me every day. Peter Poplaski is an artist who has dabbled in the American comic book industry for over three decades, mostly as a freelancer for Kitchen Sink Press, Marvel, and DC Comics. 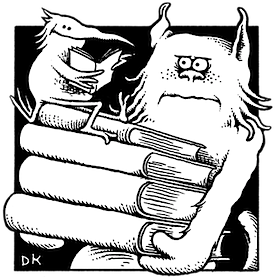 HE has edited and designed numerous award-wining newspaper strip reprint collections including Superman, Batman, Flash Gordon, Alley Oop, Li'l Abner, and Steve Canyon. The covers he drew for the Batman and Superman Dailies and Sundays series are regarded by many as definitive. He has worked closely with such creators as Will Eisner, Milton Caniff, Harvey Kurtzman, Gil Kane, Alan Moore, and Robert Crumb. 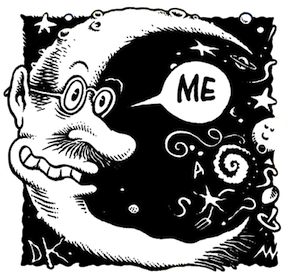 His current project is co-authoring the R. Crumb Handbook with the artist for MQ Publications in London. But his ongoing challenge and obsession is finishing ZORRO: The Myth and the Image, a definitive study of the masked heroic archetype. To see some other Poplaski-designed items available in this web store, type Poplaski in our search bar.